Another quarter has passed and the next Think Rich Pinoy Seminar is almost here, how time flies! 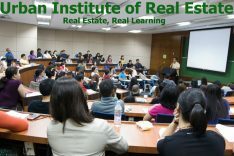 The next Think Rich Pinoy Seminar will be be held on May 15, 2010, Saturday, at the PhilamLife Building, Manila, Philippines. Special mention goes to Erwin who texted me and asked about the schedule of the next seminar, which is why I am posting the details here for everyone’s reference. Thanks Erwin! When I checked the Think Rich Pinoy website , I was glad to find out that there is still time to take advantage of the “Early Bird Fee”, which is Php2,450 or USD53 and this is valid only until April 16, 2010. That’s Php500 off the regular fee of Php2,950 or USD63 which takes effect on April 17, 2010. Learn more about the upcoming Think Rich Pinoy Seminar after the jump. What is the Think Rich Pinoy Seminar all about? Let me share with you what to expect during the Think Rich Pinoy Seminar which happens on May 15, 2010. 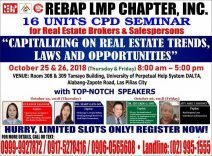 Learn from the Think Rich Pinoy TEAM who’s been buying and selling foreclosed real estate for four years now in the Philippines! Yes it can be done. You don’t need to wait for a “recession” to buy property. Get into passive income now! Buy your seminar ticket here! Talk 1 – Are you Financially Ready for the Future? The Theology of Money: Talk 2 – Are God and Money really enemies? Talks 4,5,6 – Real experiences in buying and selling Pinoy Properties from the actual (young) people who did them. OFWs-teach your family the value of money-in a fun way-via this seminar and the board game. Buy your family a couple of seats to this March 15, Saturday,2010 event. As you will see, the seminar/workshop is not the same as the book. It adds many dimensions of practicality to it. Come and join us as you continue on your journey towards passive income. The Breathlessly valuable: *Jay Abraham‘s “Master of Passive Income” transcript. “How to Create Multiple Streams of Revenue That Work 24/7 For you”. This 60+ page ebook is going to change the way you think–and earn! Who is Jay Abraham? Perhaps the world’s #1 expert on Passive Income and #1 Guru of Gurus when it comes to marketing. This ebook’s value alone is more than enough to pay for the seminar price. Special Report compiled for Think Rich Pinoy only (not available anywhere else): The top mistakes pinoy real estate buyers commit. We’re be raffling off a mentoring session: 1 Hour with Larry Gamboa. Ask him anything you want! Enjoy a MARKETING TABLE, where you can leave your calling cards, brochures for people to pickup. You can pay through Paypal or BPI bank deposit. P.S. Yes, bring a friend with you and learn together. It’s better that way! P.S. Do you have any relatives who work abroad? Tell them about this so they can sponsor you. They will be glad to, just tell them to read this website! You’ll see. 1. Who are the speakers & topics? Bo Sanchez – God vs Money, Is there really a conflict? 2, What is the difference from previous Think Rich Pinoy seminars? a. Some attendees can get to play Cashflow 202. This is a more advanced GAME w/c contains stock options (puts and calls), network marketing, easier to bankrupt and harder to leave the rat race. Don’t know what I mean? That’s okay, play Cashflow 101 instead. 202 is designed for the “veteran player” and those who believe they have what it takes to become wealthy in a short short time. b. To enhance enjoyment, there will be a contest among tables to see w/c one group gets out of the rat race more. If your group wins, congratulations, you have learned more! c. People who wish to leave brochures, calling cards, samples to market to the seminar attendees may do so using a promotion/marketing table. d. One of the attendees (you?!) can get to win a one hour mentoring/Q&A session with Larry Gamboa. It’s a raffle. 3. How to register for the Think Rich Pinoy Events so I can participate? Paypal/Credit Card: Buy your seminar ticket by clicking this link. 4. How to confirm my registration? Just email thinkrichpinoyseminar@gmail.com with the scanned deposit slip or paypal acknowledgment receipt with following data: Name, Address, Email Address, Cell # and Landline # AFTER you have paid via paypal or bank deposit. 5. Can we get a group discount? If there are five of you, you can avail of the early bird discount (P2450.-) even until the last day of payment (May 10). If you want to attend AGAIN, you can pay 50% of the fee (P 2950 * 50% = P 1475.00) – just P 1475.00 to attend again and play cashflow 202 or 101, perhaps to challenge yourself. But you must hurry because there are very limited slots for these. 7. Maximum number of participants? We can only accommodate 120 participants per session. 8. Is this a scam? No. This is a financial education seminar and Cashflow game. The game uses play money. However, if your mindset is “scam” – unfortunately this is not the place to go – you won’t find any. 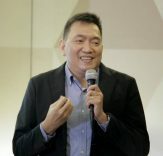 The goal of Think Rich Pinoy is to create wealth –using whatever legal means-though primarily through real estate – because that’s the safest way to go. 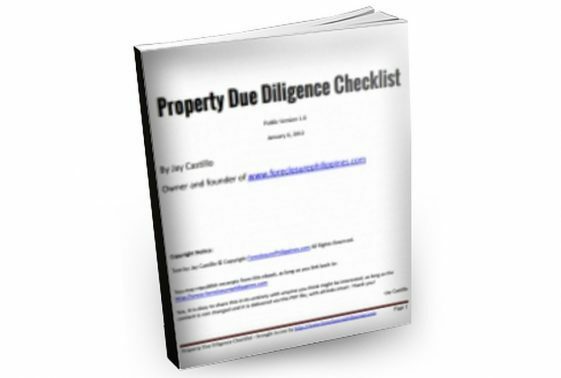 You will not be required to buy property from Think Rich Pinoy people (at any given time we actually have only a handful available properties and we don’t get investors just because they have the money) -you go buy them from sellers out there in the world. We just enable you to start building your wealth. Real Estate Investing Wisdom is not taught in schools. That’s why we’re doing this. But the Think Rich Pinoy is NOT an end of learning,it’s a beginning -so please do not make the mistake of thinking you’ll become wealthy because of this one seminar. 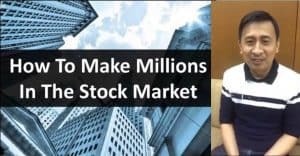 You might get one idea that can propel you to become a millionaire, it happens quite a lot. You might get it from the people, the game, the seminar, who knows? The important thing is -you’re ready to accept that idea and run with it. That’s where Think Rich Pinoy comes in-we make you ready or at least we set you off to the path of becoming wealthy. 9. Can I pay on the site (UN Avenue Venue)? You may but there’s no guarantee of being able to play cashflow as the slots are very limited. Better to secure your seat via credit card (using paypal.com Buy your seminar ticket here!) or deposit to the bank. If you’re abroad, the best way is to open a free paypal.com account, connect your credit card to it–following it’s directions –so you can buy a ticket online. Connecting your credit card to a paypal account is not a quick thing to do-so I suggest you do so now-even if you’re planning to pay later. May 15, Saturday, 2010, 8am (we start promptly) to 6pm. 12. How to get there? Go down at the UN Avenue LRT station, walk towards the Manila Bay with Manila Doctor’s Hospital on your right. The Philamlife Building is in front of the Manila Pavilion/Casino Filipino. Yes, it’s ironic but that’s where the Think Rich Pinoy event is held. Enter Philamlife entrance (not the casino). Just tell the guard “Think Rich Pinoy” and you’ll be pointed to a training room just beside the nice outdoor chapel in a garden is located – so it isn’t really ironic. Just fitting. Toilets would be opposite the direction of the training room. Yes, we will serve a morning snack and lunch. 14. What should I bring? If you want an autographed copy of your Think Rich Pinoy books, bring them.Bring a camera and get a photo shoot with Larry Gamboa. Why? Because it works. Most successful people do that, why shouldn’t you? Your choice. 15. When do you plan to do a seminar here in (Country,City)? We’re coming up with a manual on how someone in your city can host a Think Rich Pinoy event. If you’re really serious about this, please contact thinkrichpinoyseminar@gmail.com and say “I want to HOST Think Rich Pinoy” and we’ll take it from there. Right now TRP events are all held in Manila. You can “count the cost” and fly in- like some people do or simply wait it out. The most important thing is to DO SOMETHING. I just might help facilitate one of the cashflow 101 games in the afternoon. I hope to see you there!